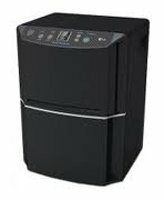 LG Dehumidifiers are widely available and large numbers are sold every year. They are pleasing to the eye and offer an alternative to some other brands which are more traditionally styled. Many customers express great satisfaction with both the 65 Pint and 45 Pint models that I have reviewed so far but a disturbingly high proportion of reviews are less positive and the common threads of complaint suggest some weaknesses in these units that may arise from their design, or from the manufacturing process. These common threads include defects that occurred within one or two years of purchase, excessive noise, inaccurate humidistats and an unexpectedly high heating effect on the air returned to the room. The 45 Pint model has received a higher proportion of negative reviews but the 65 Pint model has also received sufficient to cause me concern about both machines. In view of these concerns I do not recommend the LG Dehumidifier to our visitors. There are more positively reviewed models of similar nominal capacity and comparable price that I suggest would give more satisfaction and which I can, and do recommend. If you would like to consider an alternative brand take a look at the top picks I recommend to our visitors. I offer no comment at present on any other model manufactured by LG and will not do so until I have reviewed them. In my individual reviews of the two models mentioned on this page, which you will find by following the links below, you will find descriptions of their characteristics and explanation of the advantages and disadvantages of those characteristics. At the foot of each review page you will see our summary of consumer reactions to the products and my recommendations. At the end of the day you will make your own choice and I encourage you to look at other sources of information, including other web sites, before doing so. I hope that my contribution will have added to you knowledge and understanding and helped you to make the best informed judgement possible. For those of you who know little or nothing about LG I have provided a brief outline of the company in the next section. The LG Dehumidifier is well known as one of the foremost brands in the world. Here is a little background information about the company that manufactures it. LG is a major conglomerate established in The Republic of Korea (South Korea). It was formed in 1947 as the Lak-Hui Chemical Industrial Corporation. In 1958 the Goldstar Company was established as a subsidiary. Now known as LG Electronics it is this subsidiary which manufactures the LG Dehumidifier, a range of other appliances and electronic goods, including TVs and cell phones. The LG LD650EAL is a high capacity portable which has the power to remove 65 pints of moisture from the air per day. A unit of this capacity is suitable for a basement of 1100 to 1200 square feet. An appliance of this type is designed to be used at an ambient temperature that would be comfortable for you and your family, 65°F/18°C and above. At lower temperatures the LG LD650EAL will not be fully effective and so is not ideal for a cooler basement. The LG LD650EAL is generally similar to other high capacity portable models and has all the usual features you would expect to find. One unusual feature is the black finish of the LD650EAL's casing. Some users may prefer this color to the usual white and other light finishes used on most other brands. In reviews consumers have given a mixed verdict on the LG LD650EAL. Complaints focus on excessive noise, short working life time and difficulty in removing the water bucket. In my judgement the LG LD650EAL is effective but is not a model I can recommend to you ahead of brands such as Danby, Frigidaire and GE. With a water removal rate of 45 pints per day the LG LD450EAL is a medium capacity unit and will cost less to run than the LD650EAL, provided it is used in an area that is not too large for its power. The LG LD450EAL will operate effectively in an area of up to 700 square feet. If you have a space that is at or close to that figure a larger capacity model is not necessary but will operate more economically. The LD450EAL is very similar in size, weight and stated noise output to the LD650EAL so there is little or no advantage in choosing the lower powered model unless the space to be dehumidified is quite small. Unlike the LD650EAL the LD450EAL is finished in the more familiar light finish found on most other portable models. Consumers have been rather more critical of the LD450EAL than the 65 pint unit in their reviews and, although this LG dehumidifier is equally effective in removing moisture from the air, it is not a model which I can confidently recommend to our visitors.